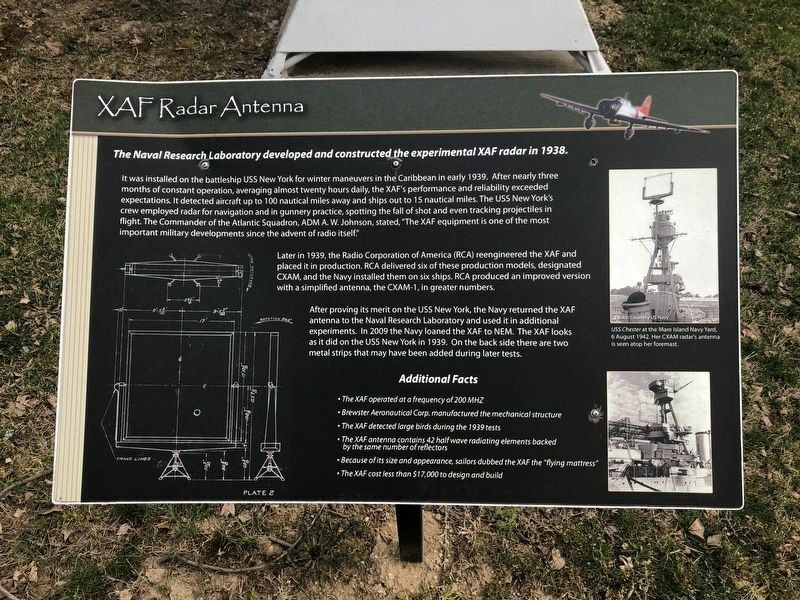 The Naval Research Laboratory developed and constructed the experimental XAF radar in 1938. It was installed on the battleship USS New York for winter maneuvers in the Caribbean in early 1939. After nearly three months of constant operation, averaging almost twenty hours daily, the XAF's performance and reliability exceeded expectations. It detected aircraft up to 100 nautical miles away from ships out to 15 nautical miles. The USS New York's crew employed radar for navigation and in gunnery practice, spotting the fall of shot and even tracking projectiles in flight. The Commander of the Atlantic Squadron, ADM A.W. Johnson, stated, "The XAF equipment is one of the most important military developments since the advent of radio itself." Later in 1939, the Radio Corporation of America (RCA) reengineered the XAF and placed it in production. RCA delivered six of these production models, designated CXAM, and the Navy installed them on six ships. RCA produced an improved version with a simplified antenna, the CXAM-1, in greater numbers. to the Naval Research Laboratory and used it in additional experiments. In 2009 the Navy loaned the XAF to NEM. The XAF looks as it did on the USS New York in 1939. On the back side there are two metal strips that may have been added during later tests. 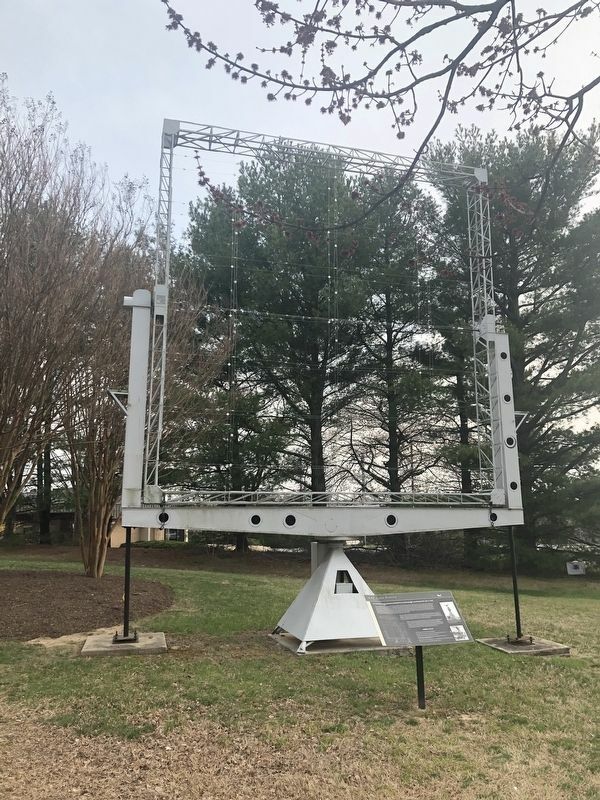 • Because of its size and appearance, sailors dubbed the XAF the "flying mattress"
Erected by National Electronics Museum. Location. 39° 11.72′ N, 76° 41.087′ W. Marker is in Linthicum Heights, Maryland, in Anne Arundel County. Marker is on West Nursery Road south of Elm Road, on the right when traveling north. Touch for map. Marker is at or near this postal address: 1745 West Nursery Road, Linthicum Heights MD 21090, United States of America. Touch for directions. Other nearby markers. At least 8 other markers are within 2 miles of this marker, measured as the crow flies. FuG 65 Wurzburg Riese (Giant) Radar Antenna (a few steps from this marker); SCR-270 Radar Antenna (within shouting distance of this marker); AN/SPG-55B Radar (about 300 feet away, measured in a direct line); TPS-43 (about 300 feet away); Nike Ajax (about 300 feet away); Stoney Run Train Station (approx. 0.8 miles away); Elkridge Furnace Inn (approx. 1.7 miles away); Linthicum Heights (approx. 1.8 miles away). Touch for a list and map of all markers in Linthicum Heights. More. Search the internet for XAF Radar Antenna. Credits. This page was last revised on March 31, 2019. This page originally submitted on March 31, 2019, by Devry Becker Jones of Washington, District of Columbia. This page has been viewed 73 times since then. Photos: 1, 2. submitted on March 31, 2019, by Devry Becker Jones of Washington, District of Columbia.